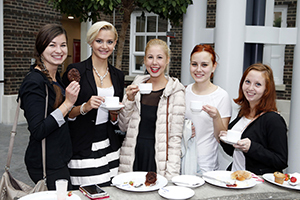 Middlesex University has welcomed this year’s intake of overseas students - by throwing a Great British Tea Party in their honour. 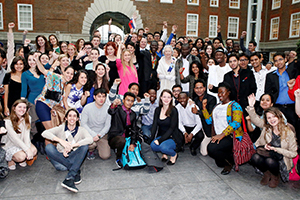 350 international students attended the event on Friday 26th September, in the Quadrangle at the University's Hendon campus. They were entertained by a live pianist, and were able to enjoy a quintessentially British selection of tea, cakes and cucumber sandwiches. They were also addressed by the Deputy Mayor of Barnet David Longstaff, who celebrated the London borough of Barnet's heritage and culture. He explained: "There is huge cultural diversity in the Barnet community. For example, over 170 first languages and dialects are spoken in schools across the borough." The Deputy Mayor also emphasised the significant role Middlesex University plays in the local community, brings top-class educational facilities and investment to the borough. He concluded by telling the new students: "This is the time to use your passions and talents to build the best possible course for your life." The event was designed to introduce the students to the British university system, and also to help them break the ice with each other and make friends. Middlesex University Head of Student Engagement Marketing Ambika Kucheria said: "The students really enjoyed the tea party and made the most of the opportunity to network. Middlesex University has an excellent reputation overseas, and attracts between 1200 and 1500 new international students every year, so the event is a good opportunity to officially welcome them to London. "The University is proud to represent all the diversity, equality of opportunity and ambition that makes London great."